To set up a game of Thief’s Market, separate the three decks of cards into their “A,” “B,” and “C” stacks. You’ll recognize these by the letter on the back of the cards (as well as in the lower right corner on the front of each card). 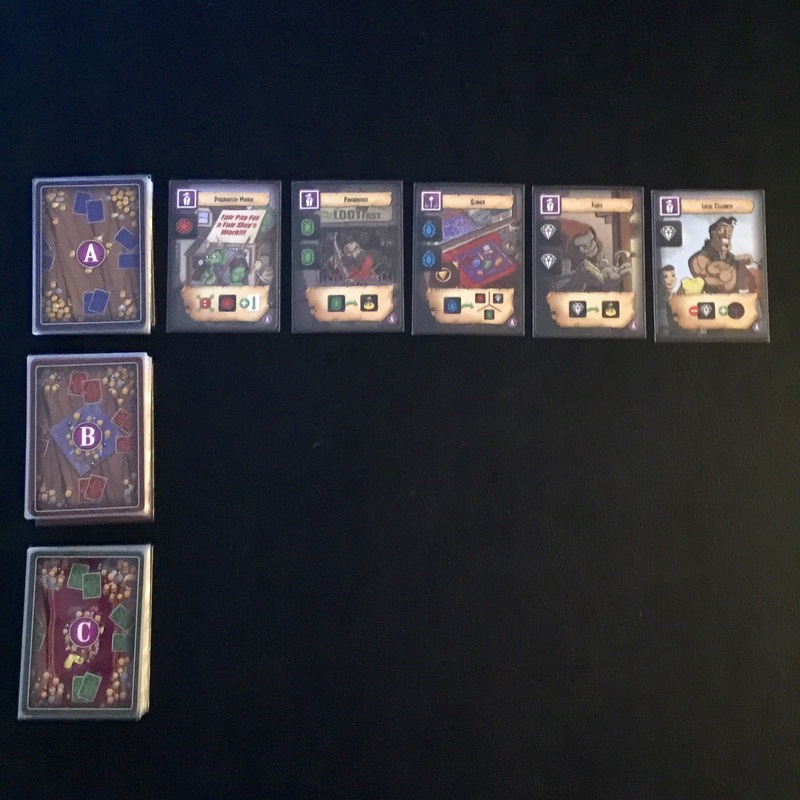 Then, shuffle each deck separately and randomly remove enough cards from each so that you have 13 “A” cards, 12 “B” cards, and 11 “C” cards, returning the others to the box without looking at them. Arrange the decks along one side of the table and turn the top five cards of the “A” deck face up to form the Market. These will act as the first five cards available for purchase to the players. Each player will be given a player mat and one gold token. Throughout the game, players can earn additional gold tokens, so make sure the remaining tokens are within reach of all players along with all of the Infamy tokens. The gold tokens are always public knowledge and will be left on the table for all to see. Infamy tokens, however, are not. When a player earns an Infamy token, it should be placed under their player mat. 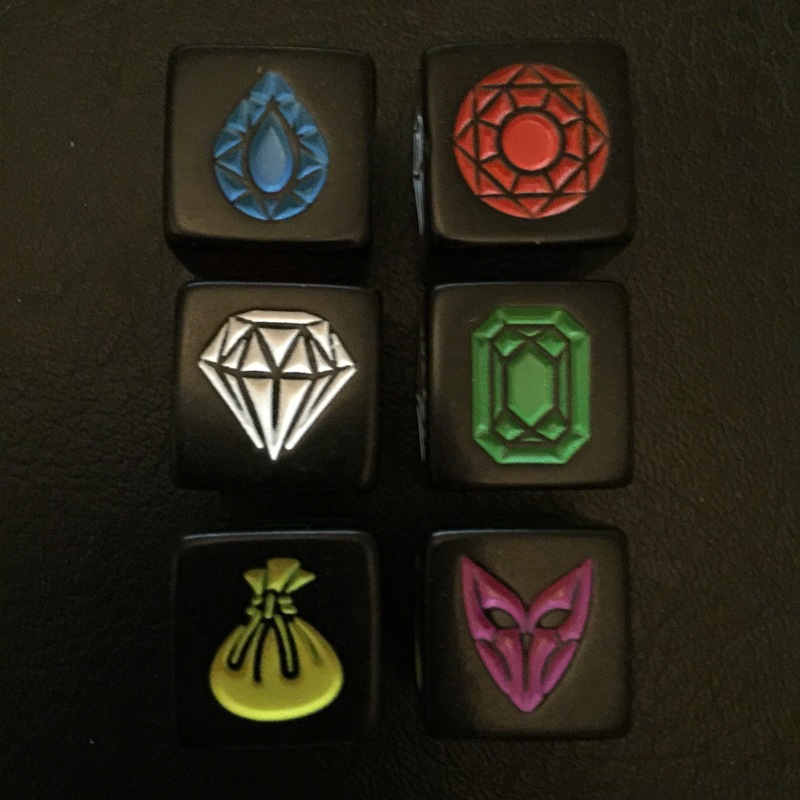 The game comes with 13 custom dice. If you have five players (the maximum the game can support), you will use all 13 dice. For four players, return two of the dice to the box, and for three players (the game’s minimum), remove three of them. Finally, give the Start Player Marker to the person who most recently stole something. In Thief’s Market, players will compete to earn the most Notoriety points. These points will be earned by purchasing cards from the Market, as well as gaining Infamy tokens throughout the game. Let’s take a look at how this is done. Before we dive into the gameplay, let’s take a quick look at the dice. Each die has six sides – four gems (one each of red, blue, white, and green), a yellow bag, and a purple mask. The four gems will be used during the Making Purchases phase to buy cards from the Market. The yellow bag will be turned in at the end of a round for a gold token. The purple mask is exchanged at the end of the round for one Infamy token, which is worth one Notoriety point at the end of the game. 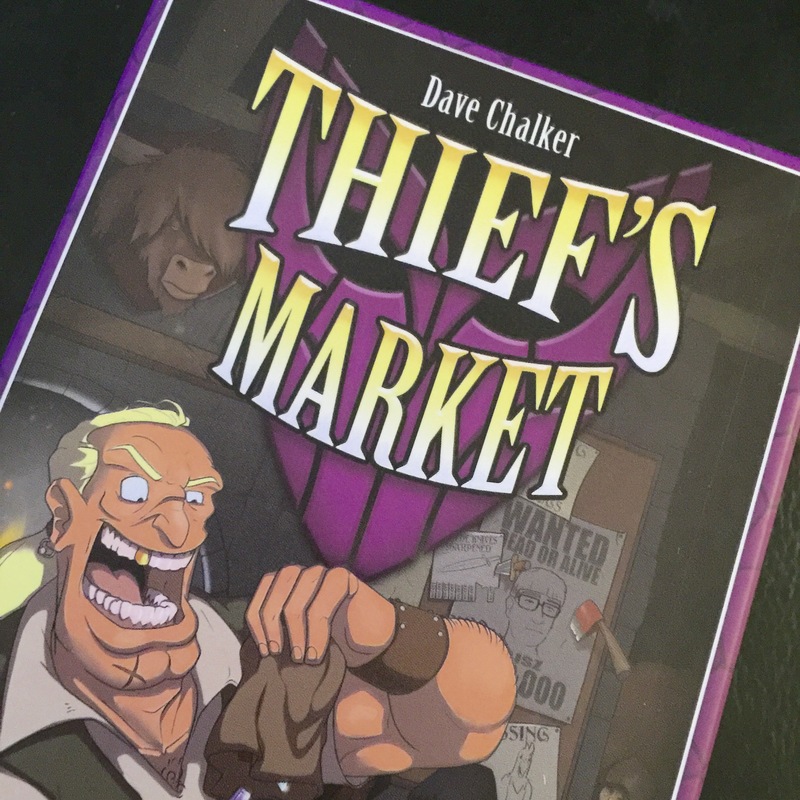 Thief’s Market is played over a series of rounds, each broken into two phases – the Split The Loot phase and the Making Purchases phase. At the beginning of each round, the first player will roll all of the dice and place them – along with the Start Player Marker – in the center of the table. This roll will act as the loot that the players have stolen, and will determine what objects are available to be split. Once the dice have been rolled and the Start Player Marker added to the loot, the Splitting The Loot phase begins. The player who rolled the dice (the start player) will take any quantity of objects (dice and/or the Start Player Marker) from the center of the table and place them in front of themself (being careful not to change the face of the dice as they are moved). Play then moves clockwise to the next player. On their turn, each player chooses to either take any quantity of the remaining items from the center of the table or steal the entire pile of loot in front of another player. If a player chooses to steal another player’s loot, they must keep at least one object and return at least one object – rerolling any dice – to the center of the table. This means that a player cannot steal loot from any player who only has one object in front of them. 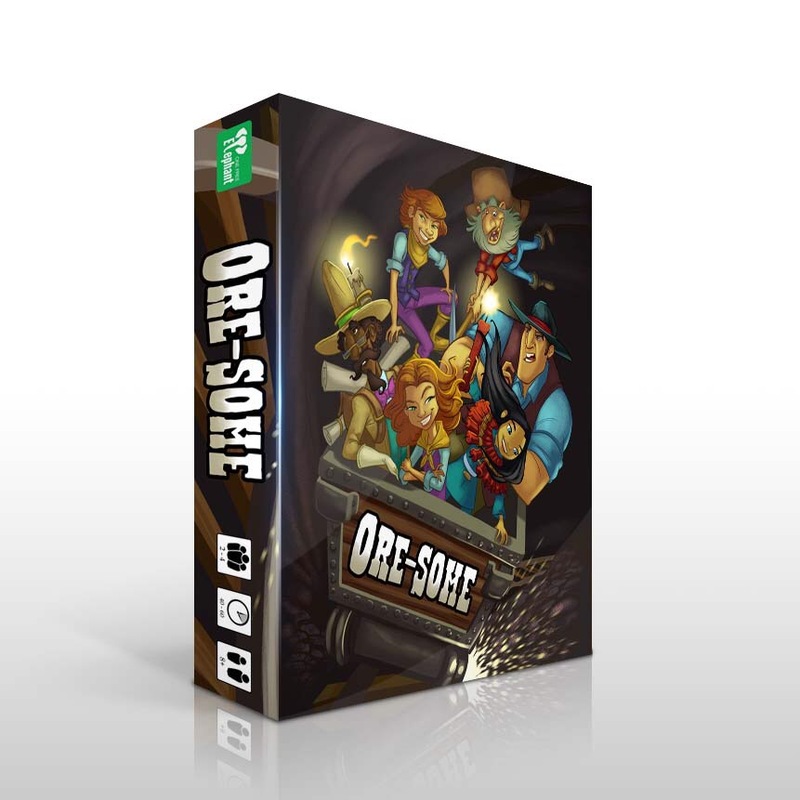 Play continues clockwise until each player has a pile of loot in front of them. If play gets to a player who already has loot in front of them, that player is skipped. Only players who have no loot continue taking turns. If there is only one player remaining with no loot, and they choose to take objects from the center, they must take all remaining objects from the center. This means that once all players have a pile of loot in front of them, there will be no objects remaining in the center of the table (which means someone will always have the Start Player Marker). When all players have a pile of loot in front of them, the Making Purchases phase begins. 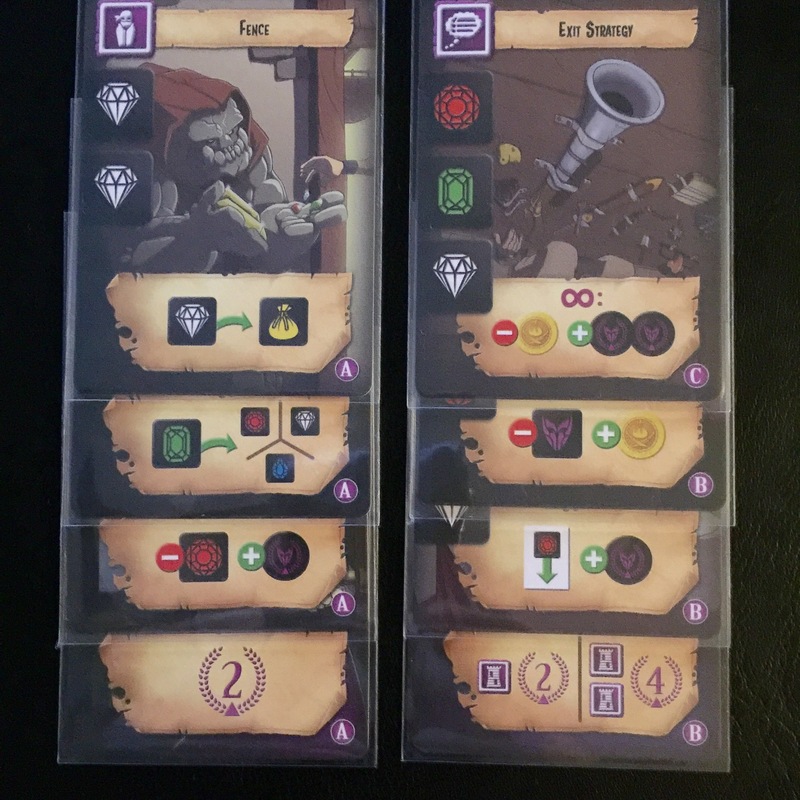 Beginning with the player who now has the Start Player Marker and continuing clockwise around the table, players will use the dice taken during the Splitting The Loot phase to purchase cards from the Market. Each player will be able to purchase a single card on their turn – unless they have a card that allows them to purchase more. 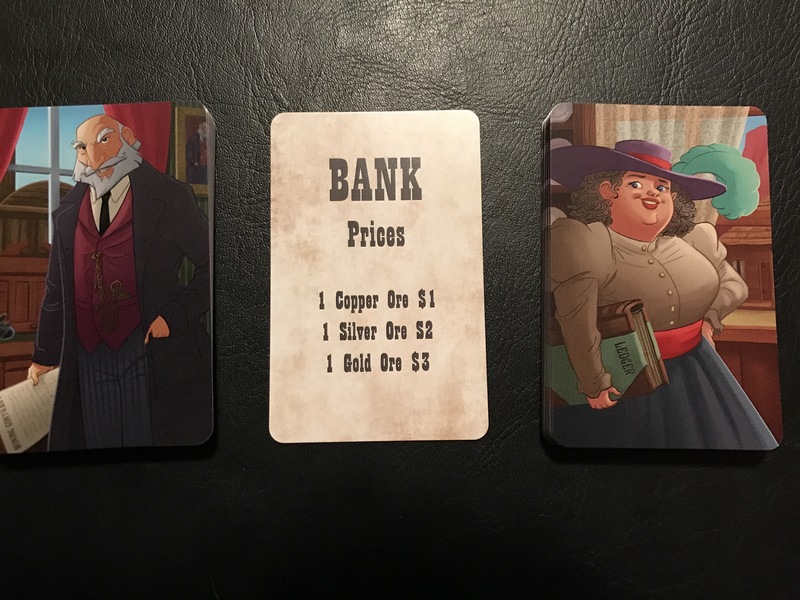 The cost of each card is shown on the left side next to the illustration. When dice are used to purchase cards, they are returned to the center of the table. Each gold token acts as a wild and can take the place of any gem on a card’s cost. When spent, gold tokens are returned to the pile. It is important to remember that yellow bag die are not counted as wild. They will be exchanged at the end of the round for gold tokens, which can be used as wilds beginning with the next Making Purchases phase. Each player will have one chance to make a card purchase with their dice. If a player has a card that allows them to purchase more than one card, all purchases are made on the same turn. Once all players have made their purchase(s), each yellow bag die is exchanged for one gold token, and each purple mask die is exchanged for one Infamy token. All dice are then returned to the center of the table – even the dice that were not used for purchases. The Market is refilled from the active deck. For example, if two cards were purchased from the “A” deck during the phase, the top two cards will be drawn from the “A” deck so that there are, once again, five cards available for purchase in the next round. If the “A” deck is empty and there are still spaces that need refilled, immediately draw five cards from the top of the “B” deck and place them next to the “B” deck. These cards will be available for purchase in addition to any still left over from the “A” deck, so there may be instance where the Market will contain more than five cards. Cards purchased from the “B” deck will be replaced (any cards left from the “A” deck that get purchased are not replaced). When the “B” deck runs out, add five cards from the “C” deck to the Market. The game ends immediately when the “C” deck does not have enough cards in it to completely refill the Market. So … what can you purchase? There are a variety of cards available for purchase in the Market. Some cards are worth Notoriety points at the end of the game. Some will give you end-game Notoriety points based on the types of cards you’ve purchased, and some will be worth less if your opponents have purchased cards of certain types. Quite a few of the cards allow you to manipulate the dice during the Making Purchases phase, allowing you to change the face of a die. There are also cards that have an immediate effect. If you purchase a card that grants you a special ability, you can use that ability during the same turn. Once cards are purchased and placed in front of you, they cannot be stolen by other players. An example of some of the card abilities can be seen in the picture to the right. If the iconography on some of these cards is confusing, don’t fret. The rules contains a list of every single card available in the game – listed alphabetically – that says (in plain English) what each card does. So you’ll never have to guess what a particular card will do for you. For your first few playthroughs, I’d recommend keeping the rules close by for reference. So, is Thief’s Market the next Splendor? Did it live up to my expectations? Well, let me start by saying that the game plays quite differently than Splendor. 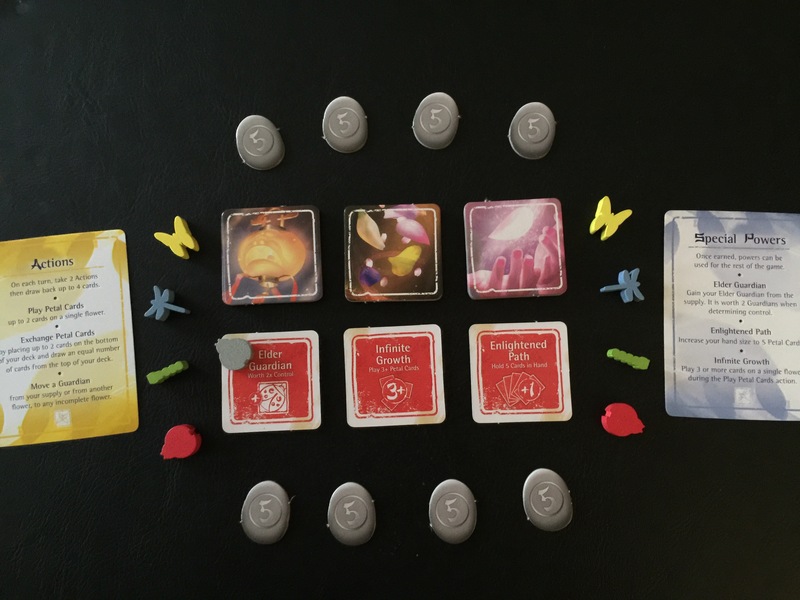 There is some resource management and some set collection (like Splendor), but it is handled differently. So, no. Thief’s Market is not another Splendor. That being said, I absolutely love playing this game. It’s a simple game to teach, plays in 30-60 minutes, but still has a ton of strategy to work through. The concept of either taking available loot or going more “take that” and stealing form one of your opponents keeps the game changing all the time. No two games are alike, and that makes the replayability factor very large. The fact that random cards are removed before every game also makes the game highly replayable. I would highly recommend this game to anyone looking for a light (but still strategic) filler game. 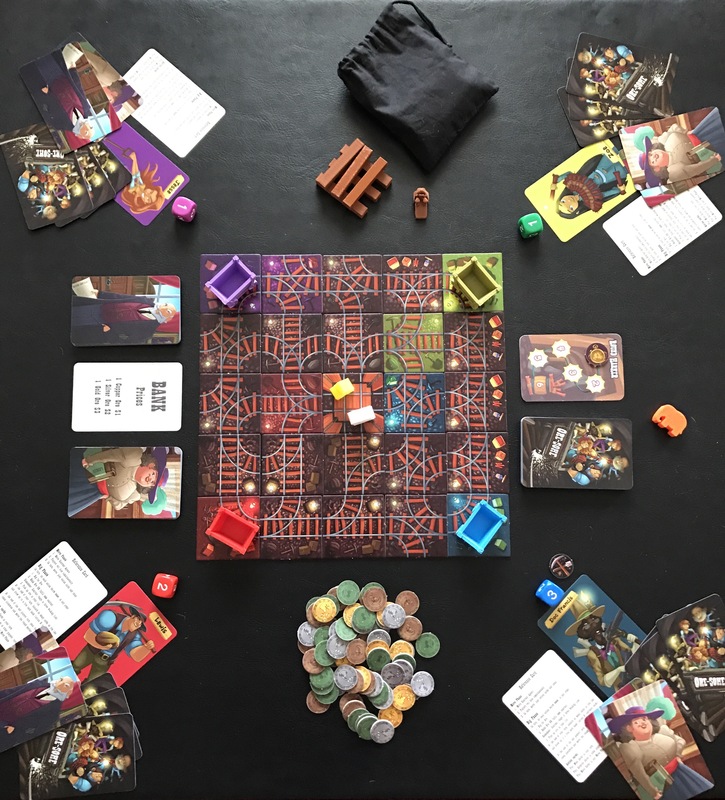 Thief’s Market won’t be the staple of your game night. It’s simply not long enough for that. However, when the time comes to play something light (either between games or while waiting for others to show up), I could see this hitting the table quite often. Thief’s Market is currently finishing up its shipment to Kickstarter backers, and will hit your FLGS soon. 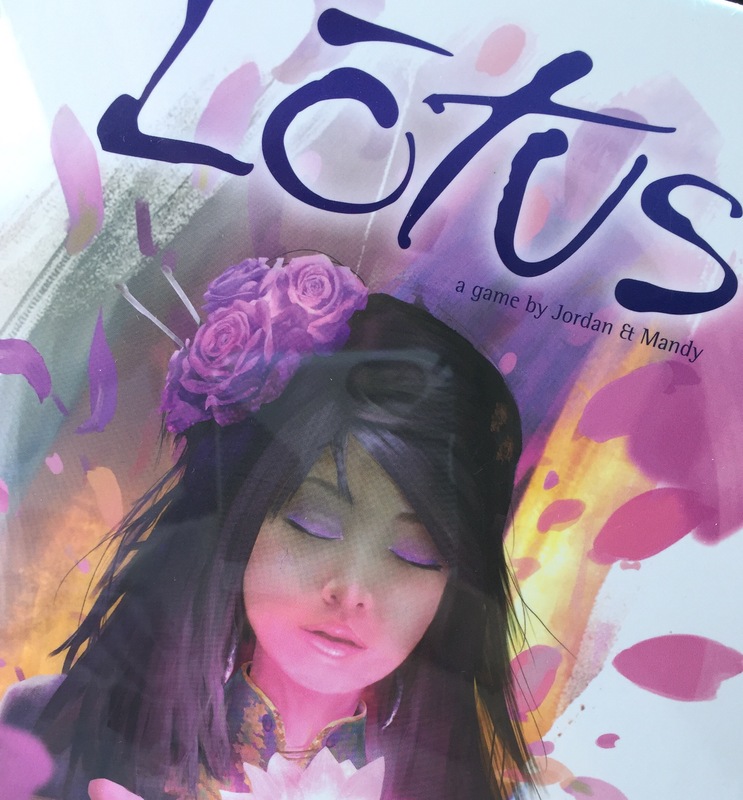 Tasty Minstrel Games does it again! Tides of Madness is set in the H.P. Lovecraft mythos, and has each player taking on the role of an investigator trying to discover ancient knowledge and secrets beyond the grasp of time and – in some cases – the human mind. 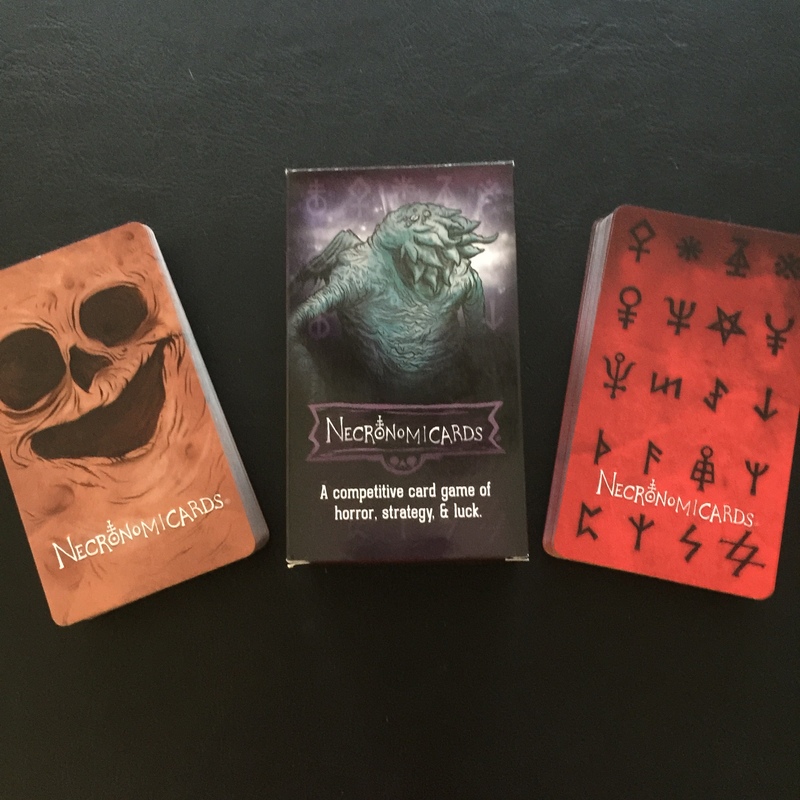 Each player will contact mysterious cults, explore hidden locations, encounter horrific creatures, and learn unspeakable words. The horror of this ancient knowledge may prove to be too much to bear for weaker minds, and one investigator – or both – could be lost forever to the madness. To set up Tides of Madness, shuffle the 18-card deck and deal five cards to each player. Set the remaining cards aside to be used in later rounds. You’ll also need to place the 20 Madness tokens nearby where both players can access them. Also, place the included scoring pad and pencil off to the side. You’ll use these at the end of each round to calculate each player’s points. Tides of Madness consists of 18 cards. These are broken into five suits – with three cards of each suit. There are also three cards that have no suit. The suits in the game are pictured to the right and are – in order from top to bottom – Races, Locations, Outer Gods, Great Old Ones, and Manuscripts. These suits are shown in the upper left corner of each card. Of the 18 cards, eight of them are dangerous to play. They are the more powerful cards in the game, but induce madness to the player who plays them. Each of these eight cards are easily identified by the tentacles along the left side. Every card also has a name (in the lower right corner) and an ability (in the upper right corner). Most of these abilities are scoring objectives that will reward victory points if the objective is met at the end of each round. Playing Tides of Madness is really simple. 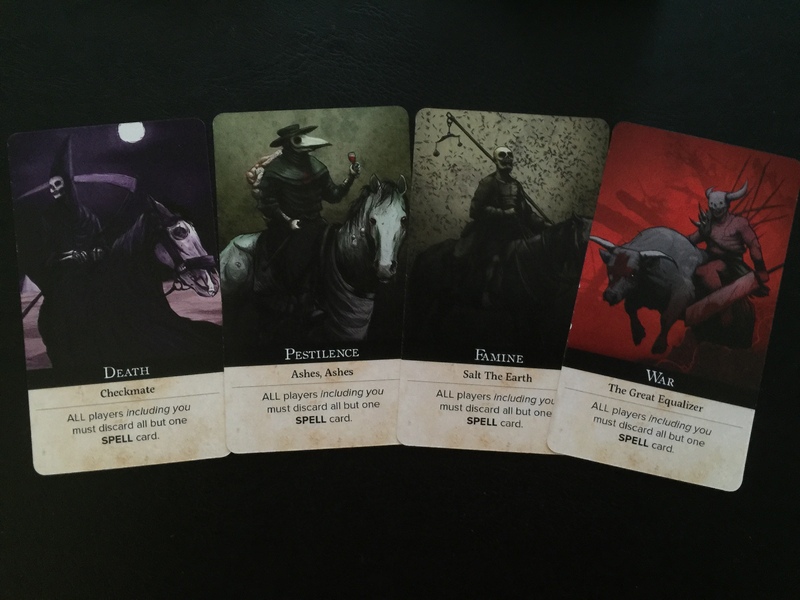 Each player will look at their hand of five cards and choose one to add to their tableau. 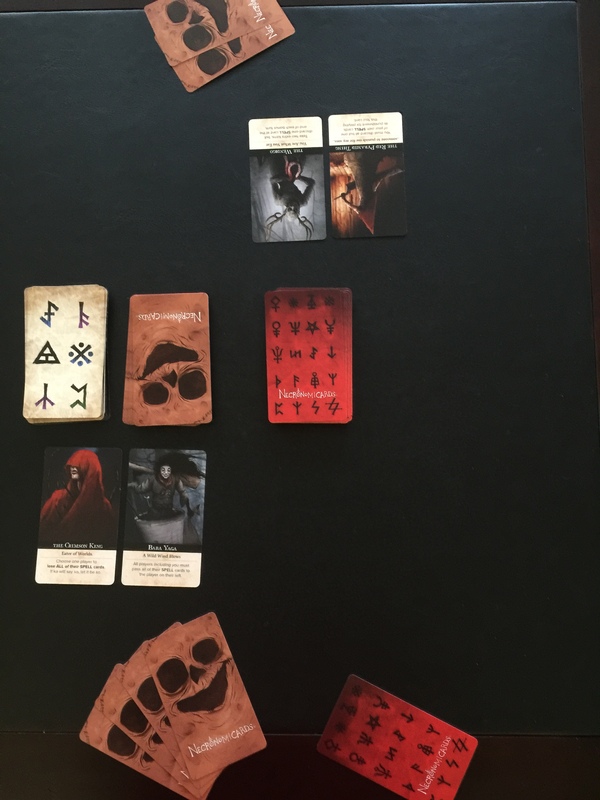 This card is placed facedown on the table until both players have made their selection. Then, simultaneously, players reveal which card they chose by flipping them over. The players then trade hands (i.e. 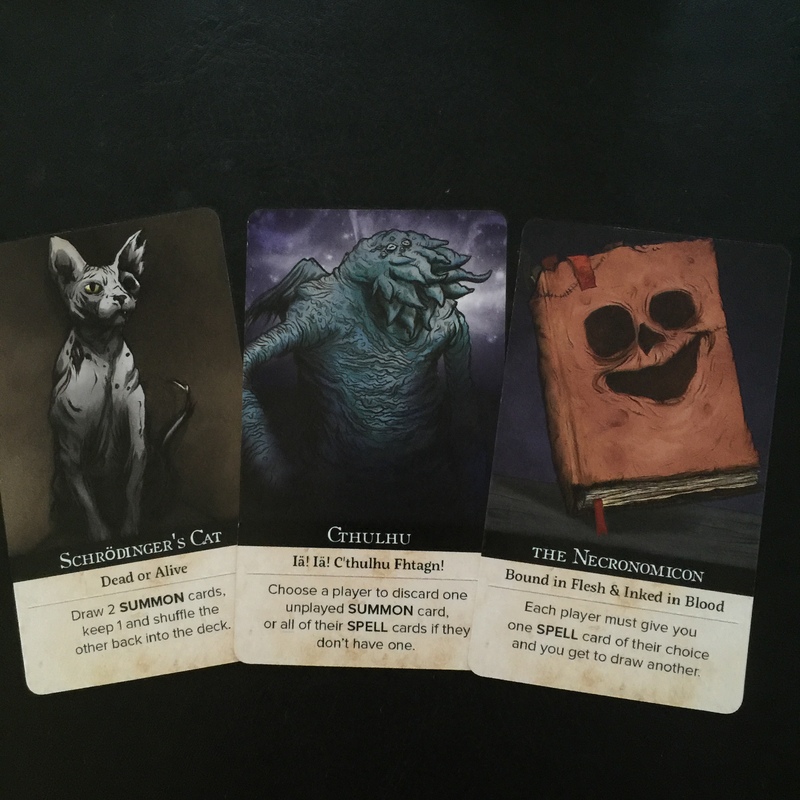 the four cards they did not select), and will select their next card from these four cards. 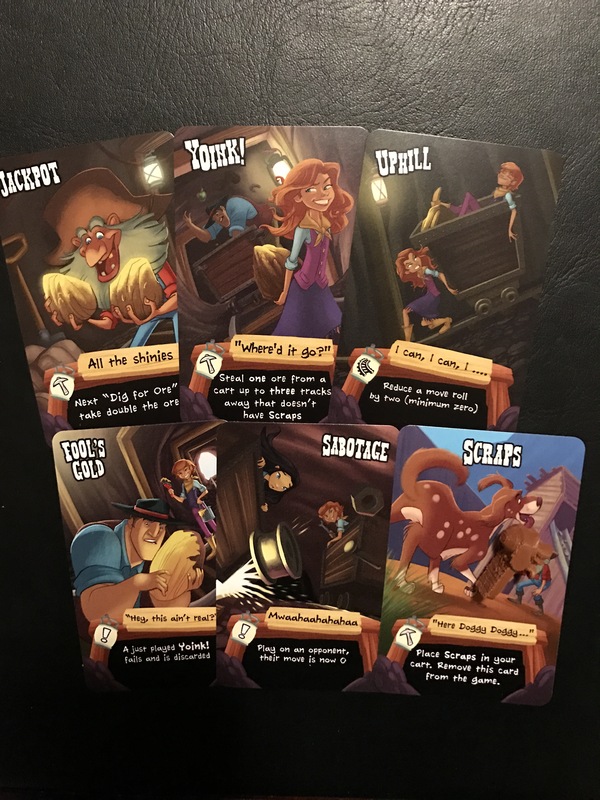 After revealing the second card chosen, the remaining cards are again swapped, a third card chosen, and so on until each player has selected five cards. These five cards are used to calculate the score – and Madness – for each player during the round (see Scoring below). 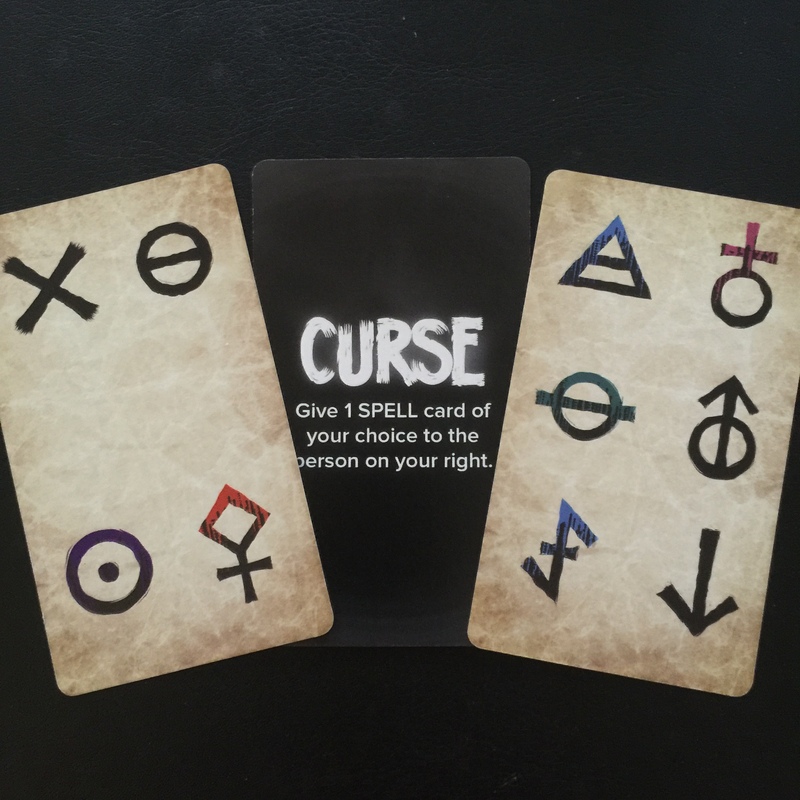 At the end of the scoring phase, each player will collect the five cards in front of them to form their new hand of five cards. 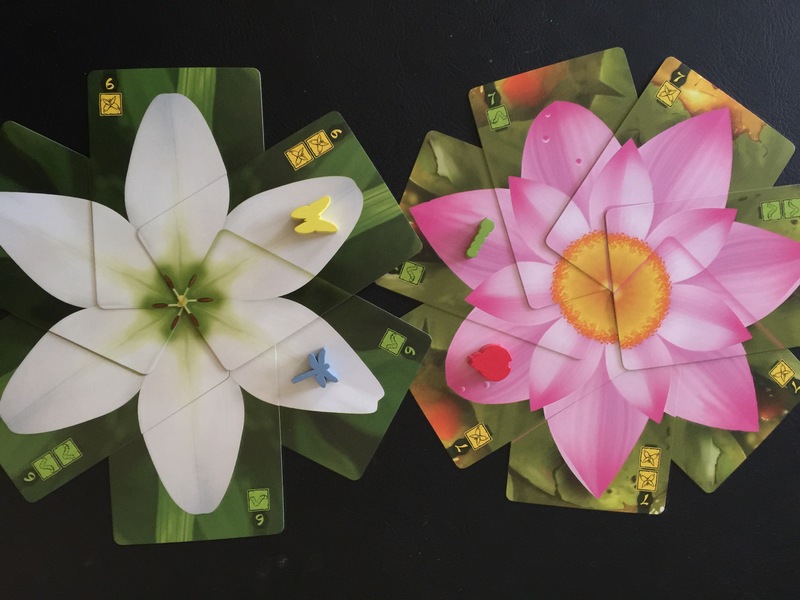 Each player will select one card to keep on the table for the remainder of the game, placing this card facedown until both have made their choice – revealing them to each other once they’ve both been chosen. They will each also select a card to remove from the game by discarding it, face-up, to the box. This will leave each player with a hand of only three cards. Deal two cards from the deck to each player to bring their hand size back up to five cards. Then play the second round exactly as the first round was played. Each player will select a card, pass their remaining cards to their opponent, select a new card, and so on until all cards have been chosen. 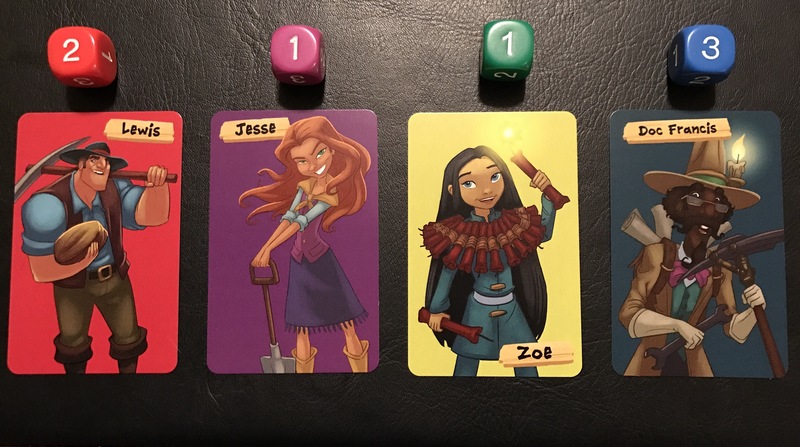 At the end of the second round, each player will have six cards in front of them – the five they selected during the round plus the card they chose to keep at the end of the first round. Calculate the score – and Madness – for the second round. 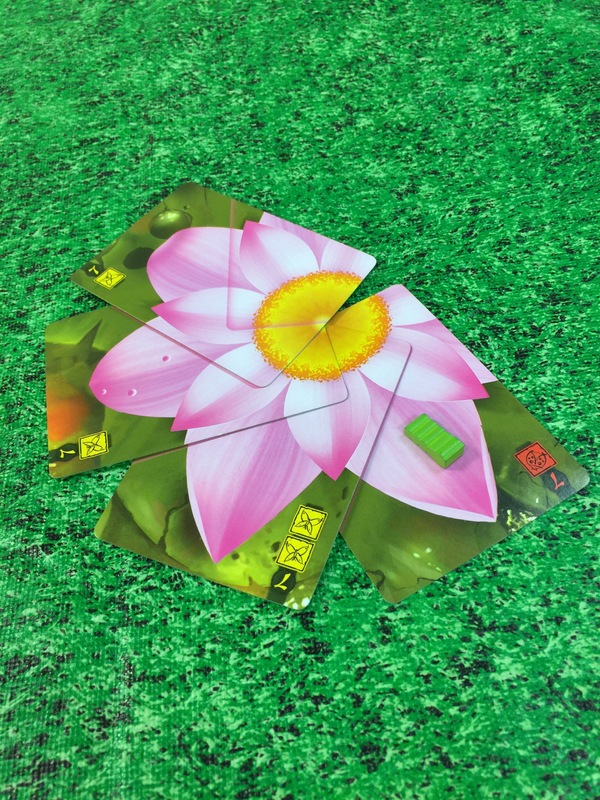 Players will then pick up the five cards chosen during the round – leaving the card they chose to keep after the first round on the table – and will each select a second card to keep and a second card to remove from the game. Two more cards are dealt from the deck to each player (this will exhaust the deck completely), and the third round is played exactly the same as the other two, with players selecting a card, trading hands, etc. 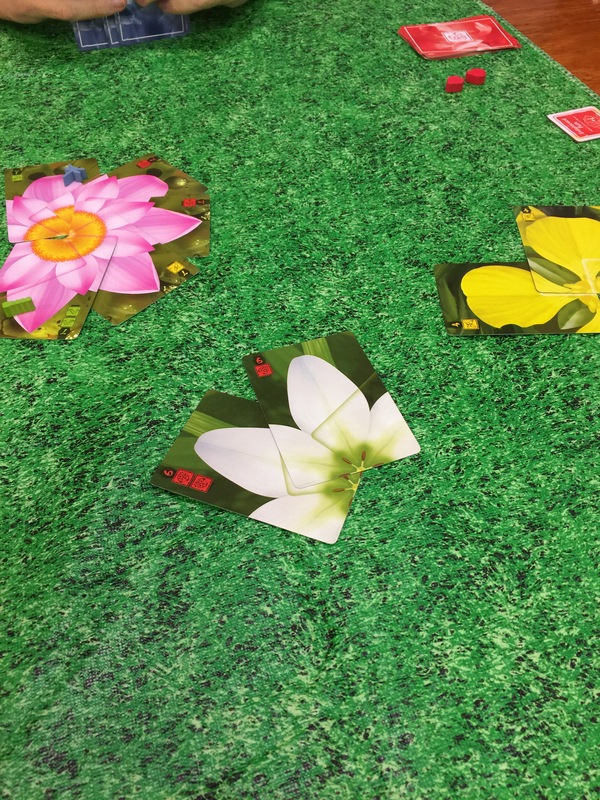 At the end of the third round, each player will have seven cards in front of them – five chosen during the round, and two cards kept at the end of each of the previous rounds. Scores – and, of course, Madness – are calculated for the third round. Then all three round scores are totaled together to give a final score. The player with the highest total is the winner. In the case of a tie, both players share the victory. At the end of each round – after each player has selected the five cards they wish to keep – scoring is calculated. First, look at the five cards in front of each player. 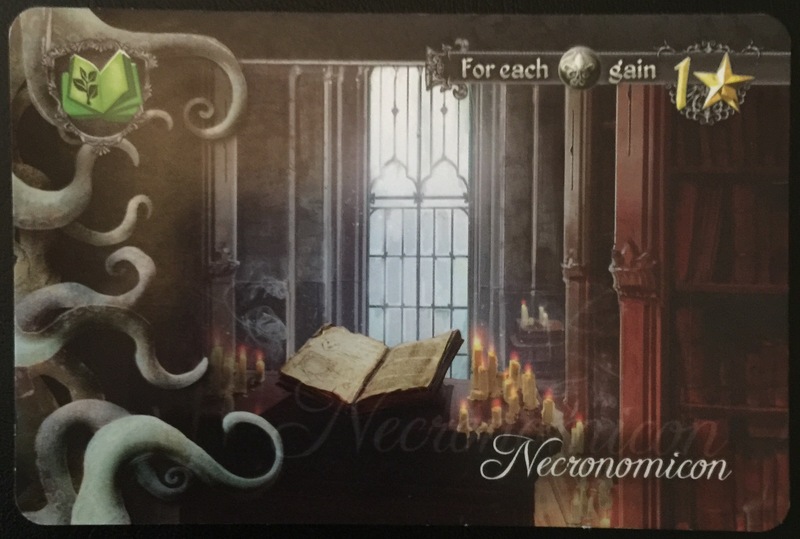 Any card that has tentacles along the left side (like the Necronomicon show to the left) have induced a bit of Madness. Each player should take one Madness token for each card they have that has driven them a little bit mad. Then look to see which player acquired the most Madness for that round. That player can choose to either score four extra points or heal one Madness by discarding one token. If there is a tie for most Madness, no player gets this choice. Then each player will check their cards for their scoring objectives and score points for any of the scoring conditions that have been met. There are several ways to score. Players can score points for each card of a specific suit, for having a majority of a specific suit, and collecting sets of suits. 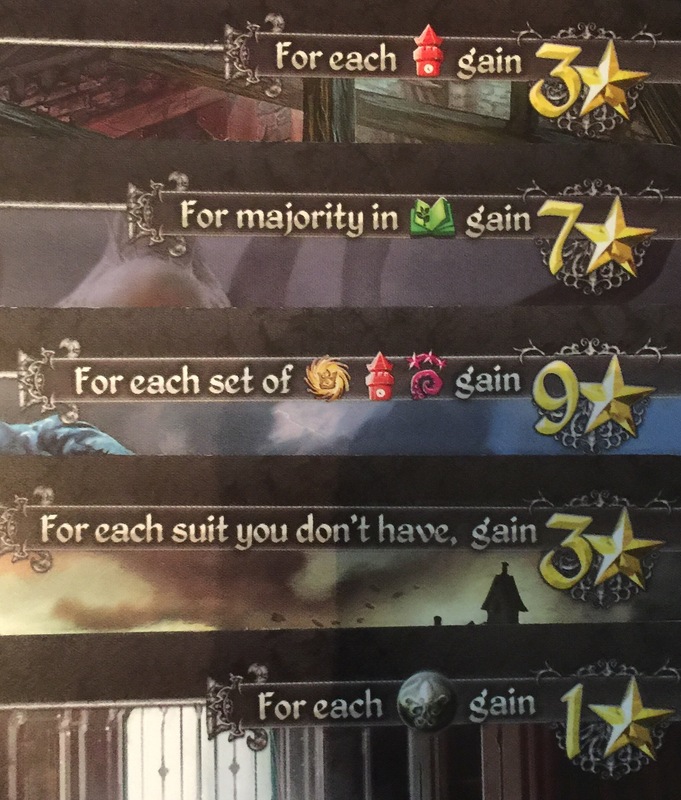 There is also a card that gives one point for each Madness token a player has acquired. If a player has nine or more Madness tokens in front of them, they have been driven insane by the knowledge they’ve encountered and lose the game immediately. If both players have nine or more Madness, they both go insane, and there is no winner. 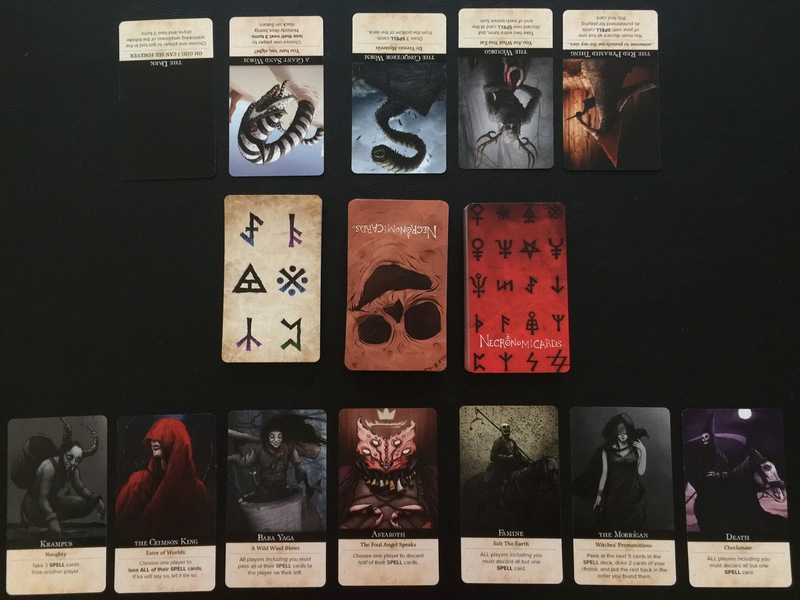 Tides of Madness is a fun, quick filler game for two players. 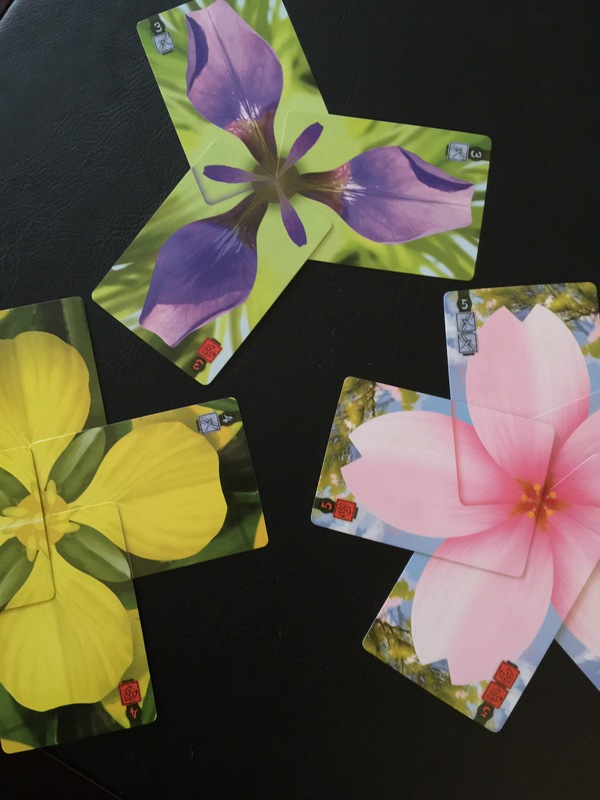 It is simple to play, but has a good depth of strategy and allows for a bit of “take that” between players – by allowing you to take cards you know your opponent needs (since you can always see what cards they’ve chosen to keep). The artwork is gorgeous, and really captures the madness-inducing mythos of Lovecraftian lore. It’s great to see some of the Great Old Ones depicted, but …. Cthulhu doesn’t induce Madness?!? What?!? And, while I’m sure it’s done for balance purposes, the fact that the Races and Manuscripts contain more Madness than the Great Old Ones and Outer Gods seems odd to me. From a realism standpoint, I’d think encountering one of these beings would induce far more Madness than simply reading a manuscript or studying a race. That’s a very minor gripe though (and is probably just me being picky). This – in no way, shape, or form – takes away from the game. The gameplay itself is very solid. 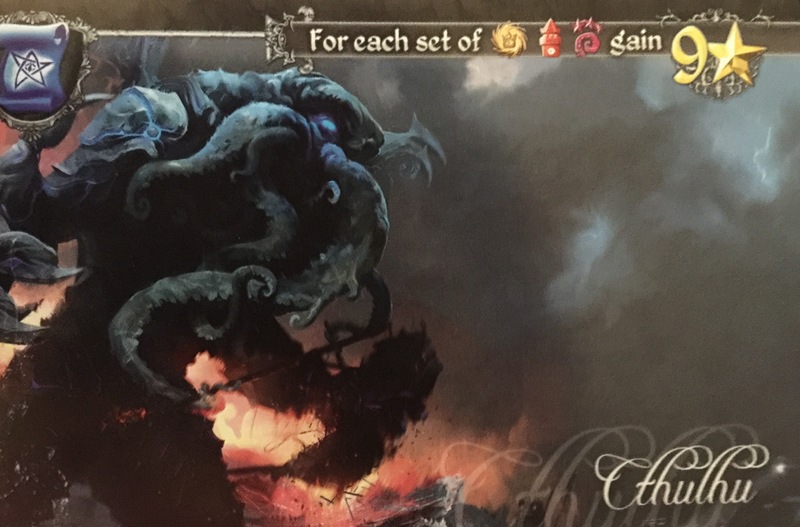 When it’s time for a light – but still strategic – filler game between sessions of heavier (longer) games, look no further than Tides of Madness, especially if you are in the middle of a Cthulhu-themed game night.